The Seniors Pairs did not take place this year. There were too few entries for there to be a viable event. ​This year's Lederer Memorial Trophy, run by the London Metropolitan Bridge association, takes place this weekend, at the RAC in Pall Mall. Ten top-flight teams are invited to take part, and amongst those coming from far and wide are (in alphabetical order) Peter Bertheau; Dennis Bilde; Boye Brogeland; David Gold; Gunnar Hallberg; John Holland; Krzysztof Kotorowicz; Cedric Lorenzini; Andrew Robson and last - but by no means least - Zia, plus too many world class players to mention. Play starts at 12 noon on Saturday, 11 am on Sunday. There will be BBO coverage throughout. If you're planning to drop by and watch in person, please observe the RAC weekend dress code. ​The Spring 2019 issue of MetroBridge News is now available for viewing on this website . Just click here. The play-off for the Ian Gardiner Trophy will be between the two highest placed teams which have all players who are 'Primary Allegiance London', and they are teams Creamer and Townsend. Note this is a change from the originally published results due to a scoring error. All involved teams have been informed. Congratulations to London member Andrew Robson who won a Bronze medal as part of an all english team in the prestigious Rosenblum Trophy. ​The Autumn 2018 issue of MetroBridge News is now available for viewing on this website . Just click here. The LMBA is sad to learn of the death of Martin Hoffman. Martin was a hugely popular player, and was considered for a time to be the best pairs player in the world. He enjoyed a long string of successes, both in the UK and abroad, spanning half a century. He played 11 times in the Lederer Memorial Trophy. More about Martin on the EBU Website. 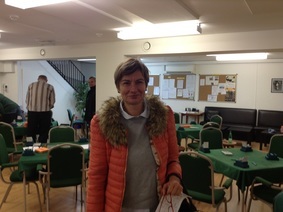 Pemberton (L to R Richard Creamer, John Pemberton, Steve Popham, Trevor Mathews) beat Sandqvist (Nick Sandqvist, Nathalie Shashoe, Qian Li, Alexandra Birchall, Tony Ye) by 30 Imps in the 48 board final and will be London's representatives in the Pachabo. Full results, reports, pictures can be found on the event blog which you can get to by clicking here. The play-off for the Ian Gardiner Trophy will be between the two highest placed teams which have all players who are 'Primary Allegiance London', and that is trhe teams that finished 3rd and 4th. ​The Spring 2018 issue of MetroBridge News is now available for viewing on this website . Just click here. The 2017 AGM of the LMBA will be held on Thursday 14th September, at the Young Chelsea Bridge Club, London W12 8HA, starting at 7.00pm. ​The Autumn 2017 issue of MetroBridge News is now available for viewing on this website . Just click here. Callaghan (L to R Franklin To, Ian Payn, Chris Duckworth, Brian Callaghan) beat Pemberton (John Pemberton, Steve Popham, Trevor Matthews and Richard Creamer) 113-102 over 48 Boards. 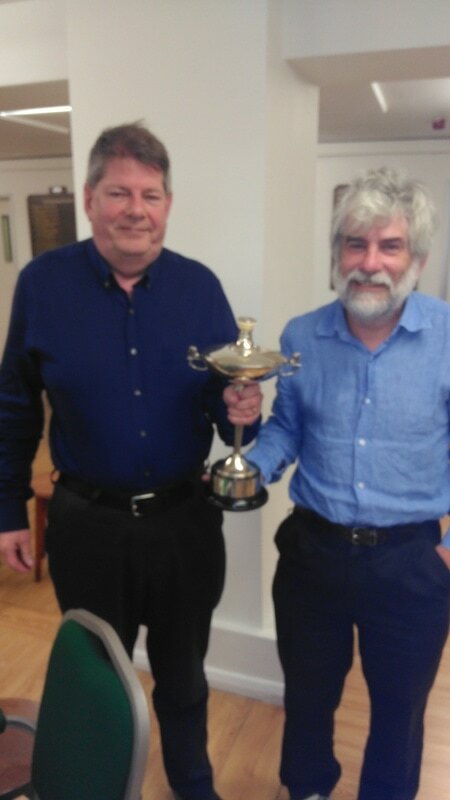 Brian Callaghan has now won the event 13 times, ahead of Ian Payn (8 times), and on 7 times apiece are Franklin To, Rob Cliffe, David Burn and Ian Gardiner, after whom the Trophy is named. London Trophy Winners (top left): CMS Alumni: (l-r)Mark Nichols (captain), Pamela Reiss, Arthur Dyson, Roy Griggs. David Reuben (not pictured) played the first half of the match. Pat Brotherston (far left) presented the prizes. 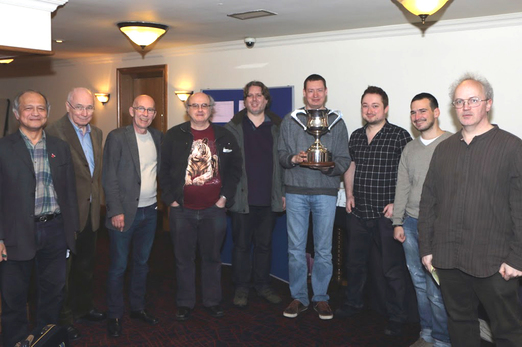 London Trophy Runners-up (top right): MCC: (l-r) Gary Diamond, Harvey Laurance, Nigel Clayton. Team captain Russell Tenzer is not pictured. Pat Brotherston (far left) presented the prizes. Della-Porta Plate Runners-up: Coolhurst 2: (l-r) Ian Kaye, Sandie Grant (captain), Jeff Lewis, Ken Kentea. Pat Brotherston (far left) presented the prizes. 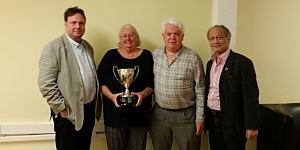 The winning team, (pictured below, left to right) was Simon Cope, Peter Crouch, Allison Green(npc), Anita Sinclair, Zia Mahmood and Jan Jansma. More pictures, full results and a report can be found on the Lederer Blog. Just click here. Due to a clash of dates, we are not able to return to the Central Hall Westminster this year. The capacity of the YCBC is limited, so whilst we expect to be able to accommodate demand on Sunday, we may have to close the entry to the Pairs on Saturday. Players are advised to enter as soon as possible for both days, as entries for both will be accepted on a strictly first-come first-served basis. The entry brochure can be viewed and downloaded here. The Spring 2017 issue of MetroBridge News is now available for viewing on this website. Just click here. The paper copies of the newsletter have been dispatched. Both these teams have all members 'Primary Allegiance London' and so both have qualified for the play-off for the Ian Gardiner Trophy. The draft minutes of the 2016 AGM can be viewed here. Long time member Sheila Peers has died. Click​ ​here for an obituary. ​The winners were Chris Townsend and Sam Oestreicher. The draw for the London Trophy can be viewed here. The London team won their qualifying group and so have progressed to the final. Well done to the successful team, which was Tom Townsend & Nick Sandqvist, Paul Lamford & David Ewart, Heather Dhondy & Brian Callaghan, Mike Bell & Sarah O'Connor, Phil King & Kieran Dyke. The LMBA 2016 AGM will be at the Young Chelsea Bridge Club on Thursday 8 Sep starting at 7pm. The newsletter can be viewed online here. Leading London Rubber Bridge host has died. Click here for an obituary. Trophy Winners: HM Treasury;Peter Donovan, Roy Westwater (captain), Peter Brook, Sir Alex Allan. Trophy Runners Up: Royal Mid-Surrey GC Karen Milliner, Christine Tomkin (captain), Neil Tomkin and Pip Smitham. Plate Runners-up: Thakeham BC : Diana Caplin, Carolyn Phillips (captain), Frances Fuller, Joan Kellett. beat Tim Gauld, Paul Martin, Stephen Popham, John Pemberton by 14 IMPS over 48 boards. The winning team are unavailable to play in the Pachabo, so the runners-up will be London's representatives in that event. Young Chelsea Bridge Club, London's representatives in the event, have won the Regional Final and so have qualified forthe National Final to take place in Solihull on Sat 25 June. The team was Chris Duckworth, Brian Callaghan, Kath Stynes, Debbie Sandford, David Muller, Trevor Mathews, Richard Creamer, Mark Davies. The leading four pairs will have the honour of representing London in the Corwen Trophy in Birmingham on 4th 5th June. A score that was incorrectly entered into the Bridgemate was drawn to our attention after the event, it has now been corrected. This has changed the final order of the teams, second and third swapping places, fourth and fifth swapping places. The revised scores are now posted (click on Results). LMBA apologises for the delay in the result of this event being uploaded correctly on this website. correct order is as now shown. Thank you for your patience with this! Andrew McIntosh, Willie Whittaker and Swede Peter Berthau won the Silver medal at the 1st European Winter Games . Congratulation to the London Team on winning the Tollemache, after a brief fallow period. The Spring 2016 issue of MetroBridge News is now available for viewing on this website. Just click here. The winner of the play-off will represent London in the Pachabo Cup in June. Congratulations to Jason Crampton and Sam Oestreicher, winners of the Palmer Bayer Trophy. for the second year in succession. The LMBA would like to extend a warm welcome to the New Chiswick Bridge Club, the West London Gay Bridge Club, 10 CC Bridge Club and The Royal Automobile Club, (Pall Mall). They have recently affiliated their Club to the EBU and chosen London as their County of allegiance. Well done! We look forward to seeing your members at some of our County events. Following the EBU's introduction of Universal Membership in April 2010, our Secretary and Newsletter Editor, Chris Duckworth, published a special edition of MetroNews for all our new members of LMBA Affiliated Clubs. Read on (Link TBA). Why not send us a hand, your news or constructive comments?